This week Ford was hit with an unintended acceleration related lawsuit, and while Toyota has recently been the victim of such slanderous claims, it was the mid-eighties Audi 5000 that was the original scapegoat for bad drivers who ran over nuns, dogs, children and desperately wanted to avoid incarceration. To heap insult on top of injury, Audi owners who hadn't killed anyone recently sued Audi USA for loss in resale value due to the widespread media attention about the issue. How can Audi owners claim that bad press caused the depreciation when Audis have always suffered from sub-par build quality, complex Rube Goldberg systems for just about everything, and expensive routine repairs, all of which leads to residual value dropping faster than stock prices in a company that mislabels IEDs as IUDs? The rapid post dealer lot price drop has not gone unnoticed to us at the Daily Turismo and we love cheap used Audis. 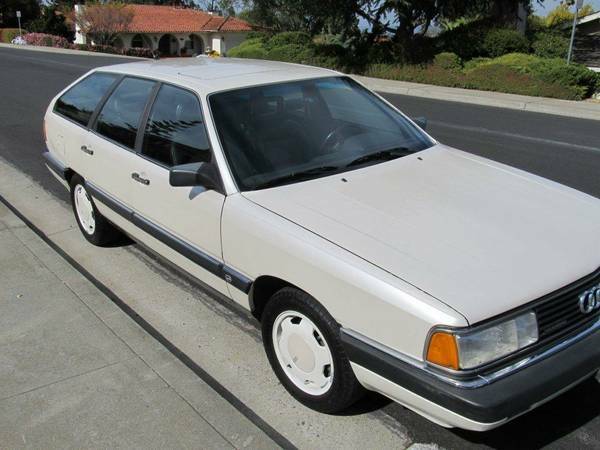 Find this 1987 Audi 5000 CS Turbo Quattro for sale in San Jose, CA for $1,800 via craigslist. Thanks to tip from Kaibeezy T.
Used Audi resale values tend to be pretty low even for more recent examples. The UrQuattro coupe retains some collectable value today, but in general the older the Audi, the lower the price. A 5000 model from the late '80s has now had a long time to depreciate, with today's example pushing 26 years old. Despite the years this Audi looks great in its original "Pearl White Metallic" paint with matching painted alloy wheels. We don't see many of these Audi wagons on the road anymore, likely because they didn't produce many when new and most have been crushed by now because they are worth more as scrap steel. 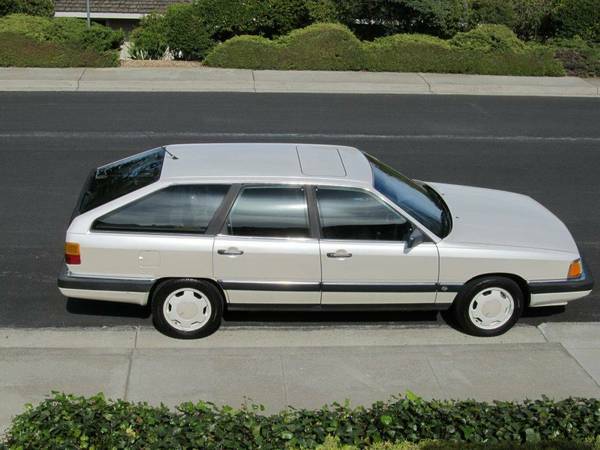 The 5000 CS Turbo Wagon offered the same engine/drivetrain as the smaller Audi 4000 Quattro Coupe, but added usable back seats and a cavernous rear hatch area with a huge maw of an opening. This 5000 is powered by the upgraded 2.2 liter inline-5 cylinder 10-valve with a turbocharger, for a total power output of 160 horsepower and 177 ft-lbs of torque. Power is put down to all 4 wheels via Audi's legendary Quattro four-wheel-drive system - which despite popular belief, does not help handling in general and does not give the car any more lateral grip in turns...unless the road is slippy and traction is limited. AWD is awesome in dirt, snow, etc but will only help a straight-line launch if the car would be able to break loose two of its tires without it (and this one couldn't, not with 160hp). 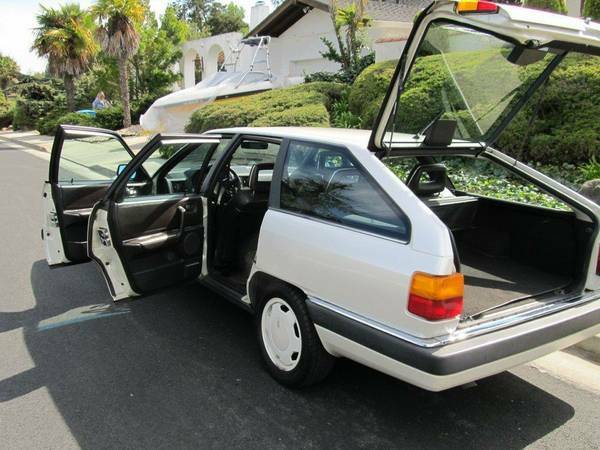 Our biggest concerns with this white whale is that the miles are high (230k...yikes!) and it isn't entirely clear if this car has a manual or auto transmission (although it appears to be a manual in one of the interior images). With the manual this thing won't be fast, but it will be entertaining to drive; the slushbox version will be both slow and miserable. The engine/drivetrain is not the same as the 4kq since the turbo engine was not available in the 4kq. There was also no 4000 Quattro Coupe, at least in the US anyway. The 5 speed manual transmission was the only trans offered in the Quattro. Starting in '92 you could get an auto trans in the 100csq. Starting in late 1989, you could get automatic quattros in the V8. ~ i have always liked the 5000s and generally seen Audis as priced below their true value. but then a Volvo wagon would drive by and yank me back to reality. @DT - good on ya, regarding the myth of all-wheel drive handling advantages. Up here in the Snow Belt, I try to explain to my non-car-savvy friends that AWD is only helpful to get you moving. After that the Laws of Physics still apply (even if Subaru drivers think they are exempt). In reality, AWD in the snow even has a down side: you may not find out that it is slippery until you try to brake or steer; and that may be too late! All that being said, this Audi looks like a nice and unusual car for the price. I love wagons, of any shape. I just would not count on putting a lot of miles on it, without spending some money. Had an '85 non-turbo, 5 speed FWD 5000 wagon ("Avant" in Europe), very rare in North America, known as "Avant" in Europe. Only thing that failed was window regulator. Adequate power, up to 30 mpg on long trips, good for its day. Avant-garde, aerodynamic styling, still looks good today. Value Vette Follow-up: 1964 Corvette is sold!